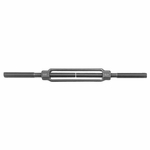 Stub end turnbuckles are made from self-colored steel because they are designed to be welded. Unlike most turnbuckles that are galvanized and come with end fittings installed--usually a hook, closed eye or open jaw--these turnbuckles are ready to be modified. You can weld custom fittings onto the end, or even weld the ends to a fixture. How you weld is up to you, but be sure to reference the American Welding Society Specifications for proper welding procedures. End fittings are Quenched and Tempered or normalized, bodies heat-treated by normalizing. 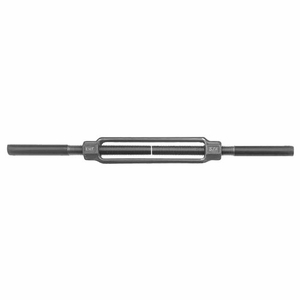 These turnbuckles meet the performance requirements of ASTM Specification F1145-92 Type 1 Grade 1 (supercedes FF-T-791B).